Its desert landscape doesn’t attract the attention that Death Valley National Park gets, but it has many things that you won’t find in any other desert park in the United States. It may sound obvious because of its name, but Joshua Tree National Park has the highest concentration of beautiful Joshua Trees in the United States. In some parts of the park, there are whole groves of these trees, which are unlike any other tree you will ever see. Joshua Tree also doesn’t get as much press as Yosemite National Park, though few other parks in the United States actually do. Joshua Tree National Park may not have the high granite rock faces like El Capitan and Half Dome that can be found in Yosemite, but it does have some of the best rock climbing and scrambling you will find in the United States. The giant rock boulders and rock formations that litter the park are some of the most technically challenging rocks to climb in North America. So while Joshua Tree National Park may not be as familiar to you as some of the other national parks in the United States, I assure you that it is an absolutely stunning park that is worth your time to explore. In this guide, I am going to give you all of the information you need to plan a successful trip to Joshua Tree National Park. I will discuss the best times to go, the best places to stay, the different things to see and do in the area, and the must-see spots in the park itself. Joshua Tree National Park is located in the Mojave Desert, about 130 miles East of Los Angeles and roughly 160 miles Northeast of San Diego. If you are looking to fly into California to see the park, then I would recommend either flying into Los Angeles International Airport (LAX) or San Diego International Airport (SAN). If you are visiting other locations in the Southwest of the United States, I have included a table below with the distance and drive time from some of the other large cities in the United States that are relatively close to the park. 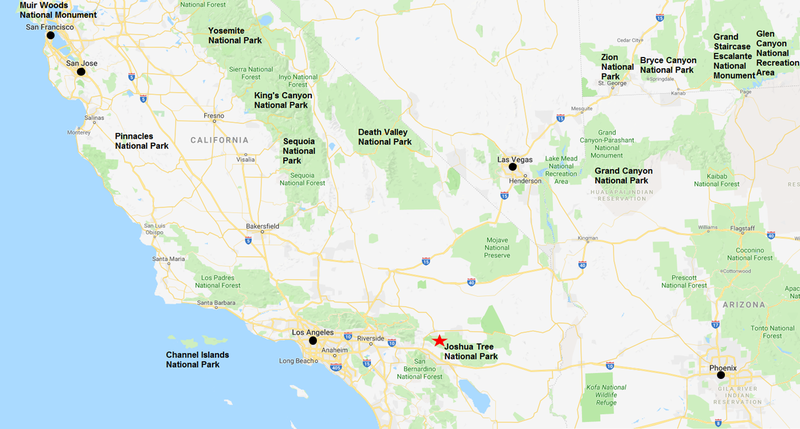 As you can see on the map below, Joshua Tree National Park is also located relatively close to a number of other national parks and monuments in the Southwest United States. If you are looking to combine a visit to Joshua Tree National Park with a stop at some other parks, I would suggest looking at planning stops at the Channel Islands National Park, Death Valley National Park, and the Grand Canyon National Park. All of these parks are relatively easy drives from Joshua Tree National Park. With a total size of roughly 1,200 square miles, there is a lot to see in Joshua Tree National Park. To give you a better idea of how to get around the park and where everything is located, I have included a park map below. 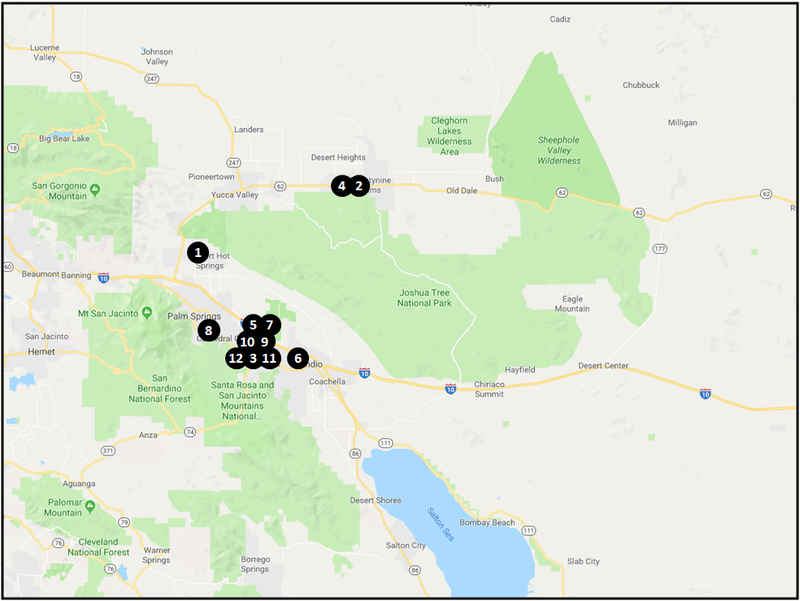 There are three main visitor centers for the park, with the Joshua Tree Visitor Center and Oasis Visitor Center located North of the park and the Cottonwood Visitor Center located in the Southern section of the park. The Park Boulevard road runs thru the Northern section of Joshua Tree National Park and the Pinto Basin Road runs from North to South to connect the Southern section of the park to the Park Boulevard Road. You will find numerous campgrounds along the road, but be aware that many of these campgrounds require a reservation. Joshua Tree National Park is a fantastic park to visit year-round, but like most places, there are factors that make certain times of year better for visiting than others. These factors include the weather, the number of other tourists visiting, and the amount of available daylight throughout the year. I discuss each of these factors in detail below so that you can make an informed decision on what time of year would be best for you to visit. Seeing as though Joshua Tree National Park is located in a desert, it should come as no surprise that temperatures can get really hot within the park during the summer months of June thru September. If you plan on visiting the park during these months, you will want to make sure that you have an ample supply of water. During the winter months of December thru February, the high temperatures in the park are typically in the mid-to-lower ’60s, which is quite mild. However, the low temperatures during this time of year can fall below freezing at night so you will want to make sure you are prepared for cold nighttime temperatures if you are going to be camping in the park. In my opinion, the best temperatures for exploring the park occur during the Spring months of March thru April and Autumn months of October thru November. During these times of the year, the high temperatures typically don’t get too hot during the day and nighttime temperatures typically don’t fall below freezing. This makes these times of year the ideal times to do a lot of hiking or climbing within the park and the most comfortable time of year to camp within the park. As you might have also guessed, being located in a desert landscape also means that Joshua Tree National Park doesn’t see too much rainfall throughout the year. 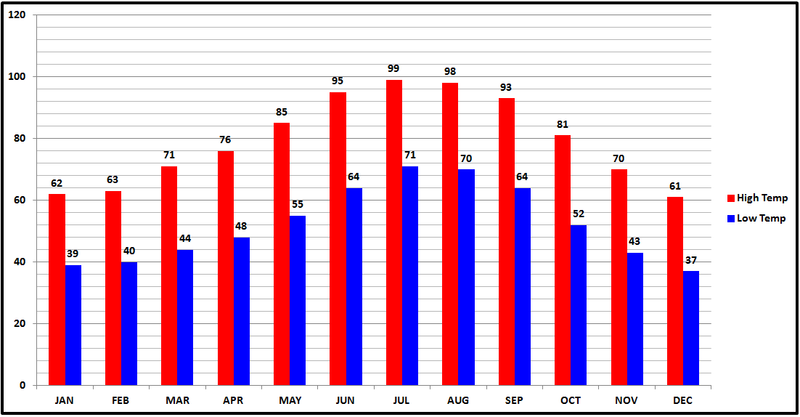 In fact, during the Spring months of April thru June, the park sees very little rainfall at all. Even during the winter months of January and February, where the park sees the highest amount of rainfall throughout the year, less than an inch of rain a month typically falls within the park. This means that you typically won’t have to worry about rainstorms ruining your outdoor activities. Even if you do see some rain during your trip to Joshua Tree National Park, the rain typically won’t last very long. Another factor that is important to most people who visit national parks is the number of other tourists they will have to contend with when visiting the parks. If you have large crowds of people to deal with as you make your way thru a park, it is a lot more difficult to enjoy the tranquility and beauty of the park. 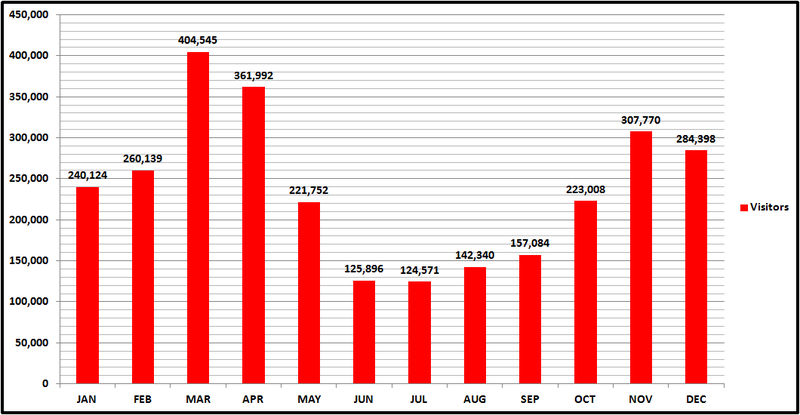 The peak visitor season in Joshua Tree National Park is in the Spring months of March and April. This is the time of year when the park is really dry and temperatures are rather moderate. You don’t get the blistering hot days and you don’t get the freezing cold nights. However, you will have to deal with bigger crowds in order to enjoy these ideal conditions. It should come as no surprise that the least busy time of year in Joshua Tree National Park is the summer months of June thru September when temperatures can be blisteringly hot during the daytime. If you are prepared to deal with the uncomfortably hot temperatures and are prepared with enough water, then this can be an excellent time to visit the park and avoid the crowds. During the Winter months of December thru February, the traffic in the park is much more moderate than it is in the Spring, and you don’t get the blistering hot daytime temperatures the park sees during the Summer months. However, if you are planning on camping out in the park, you will have to deal with nighttime temperatures that can dip below freezing. In my opinion, the ideal months to visit Joshua Tree National Park are the shoulder months of May and October. During these months the park is far less crowded than it is during the early Spring months, but the temperatures are also rather mild. These are the perfect months to visit because you will be able to enjoy moderate temperatures in relative peace and quiet. The last factor that you will want to take into consideration when deciding when to visit Joshua Tree National Park is the amount of available daylight you will have in the park. This is especially important if you are planning on taking long hikes, doing a lot of difficult climbing, or are interested in photography. 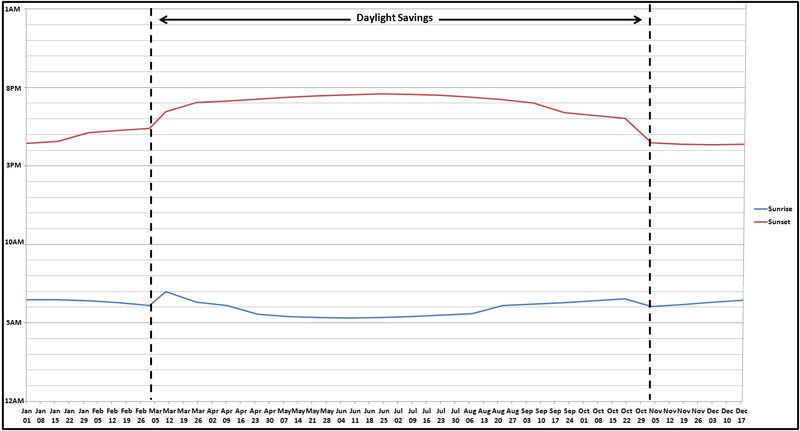 Below I have included a graph that shows you the average sunrise and sunset times in the park throughout the year, including the time changes for daylight savings. In addition to the amazing things to see and do within the park itself, there are also a lot of great things to see in do in the surrounding area. For instance, the city of Palm Springs is just a short drive from Joshua Tree National Park. This famous resort city has a lot of fun activities, including a number of great golf courses you can play. The park is also just a short drive from the beautiful Lake Havasu, which has postcard caliber beauty and is definitely worth exploring. If you are hoping to combine a trip to Joshua Tree National Park with a visit to some other US National Parks, then I would consider a stop at the Channel Islands or Death Valley National Parks, which are both a reasonable distance away. There are also a number of beautiful state parks in the Joshua Tree area, including the beautiful Anza-Borrego Desert State Park, which is one of California’s prettiest state parks. I have included a list of links to visitor guides below in case you would like to review some of these attractions in the surrounding area. If you are looking to camp out within the park, there are a number of excellent campgrounds that you can choose from. I have included a list below for you to review. If you would like to stay outside the park and are not prepared to camp, then I have also included a variety of hotel options at different price points below for you to review as well. I want to make sure your trip to Joshua Tree National Park is a complete success, so in addition to this visitor guide that I have created, I have also included a number of additional resources below for you to review. If you are looking for some activities to do within Joshua Tree National Park and the surrounding area, I have included a list of activities and excursions that I would recommend below. There are so many amazing things to see and do within Joshua Tree National Park that is difficult to list them all. Below you will find a list of the top 10 things that I would recommend that you see and do when you visit Joshua Tree. Hidden Valley is one of the first stops that you will encounter along the Park Boulevard Road when entering the park from the North. This one-mile loop takes you thru some beautiful, rocky terrain that used to be used as a cattle rustler hideout. The Hidden Valley Trail is considered one of the more scenic trails in Joshua Tree National Park and it is one of the best trails in the park to spot the different plants and animals that live in the park. Key’s View is one of my absolute favorite spots in Joshua Tree National Park. Perched on the fringe of the Little San Bernardino Mountains, Key’s View gives visitors some absolutely stunning views of the valley and the Coachella Valley. If possible, I would try and make it to Key’s View for a sunrise or sunset as you can get some absolutely epic pictures at Key’s View during the Golden Hours of the day. If you are visiting Joshua Tree National Park to do some rock climbing, then you will not want to miss out on the Quail Springs area within the park. If you are coming into the park from the West Entrance in the North, then it is the first major stop that you will encounter on the Park Boulevard road. Quail Springs includes a number of wonderful rock faces that are excellent for climbing, including the famous West Face of the Quail Springs rock formation, which is one of the most frequently climb rock faces in Joshua Tree National Park. Jumbo Rocks is another one of my favorite areas within Joshua Tree National Park, and the location of my favorite campground within the park. Within the Jumbo Rocks area of the park, you will find an abundance of amazing rock formations that you can hike and scramble thru, climb, or just sit back and admire. The Jumbo Rocks Campground is my favorite campground within the park and usually fills up fairly quickly. So if you would like to camp at Jumbo Rocks, you will need to make sure you reserve your spot as early as possible. One of the most famous rock formations in the Jumbo Rocks section of Joshua Tree National Park is Skull Rock, which is pictured above. This unique and interesting rock formation got its name because it looks a lot like a human skull. If you are camping in the Jumbo Rocks campground, there is a short 1.5-mile round-trip hike that takes you to Skull Rock. If you aren’t up for a hike or are not staying in the Jumbo Rocks campground, there is also a stop along the Park Boulevard for Skull Rock as well. The rock is located just off the road so there isn’t really any hiking involved to see it. Another of the amazing rock climbing locations within Joshua Tree National Park is the Hall of Horrors area of the park. The Hall of Horrors gets its name from the many climbing routes available to the top of the Horror rock formations. There are plenty of different climbing routes and rock scrambles available to visitors in the Hall of Horrors, which makes it one of the more popular areas of the park. It is also another amazing location to take sunset pictures in the park, so if you are into photography I would strongly suggest stopping by around sunset. With all of the focus on the beautiful Joshua Trees and rock climbing, it is very easy to overlook the Cholla Cactus Garden in the center of Joshua Tree National Park. However, this is a stop you will not want to miss out on as the cactus garden is absolutely beautiful. So make sure you save some room on your camera’s memory card for the many photographs you will want to snap at the garden. If you are an avid rock climber, then you are probably very familiar with how popular Joshua Tree National Park is with rock climbers. Some of the most technically challenging rock faces to climb in North America are located in the park. Even if you are a novice at rock climbing, there are routes with a variety of different levels of difficulty to climb, so there is something for people of all abilities. If you are interested in learning more, I have included some resources below that were written by people who know far more about climbing at Joshua Tree National Park than I do. Even if you aren’t interested in rock climbing, the rocky landscape of Joshua Tree National Park offers some of the best rock scrambling available in North America for hikers. If you aren’t familiar with what rock scrambling is, imagine taking a hike thru an obstacle course of large boulders that you have to climb over, go around, or even go thru to continue your hike. It is far less technically challenging than rock climbing but far more of a challenge than simple hiking. The best part is that you choose your route, so the rock scrambles only have to be as difficult as you want them to be. Though Joshua Tree National Park doesn’t have the high elevations that its sister parks in California like Yosemite and King’s Canyon have, there are still a few mountain hikes that are challenging enough to be worth the effort for avid hikers. The most famous of which is the Ryan Mountain hike. Don’t be fooled by the distance of this roughly 1.5-mile hike as the elevation change is very dramatic. On most of this hike you will be ascending almost vertically, so the hike is rated as very difficult. However, if you are up for the challenge then you will be rewarded from some absolutely amazing views from the highest point inside Joshua Tree National Park. One of the best rock scrambling hikes available in Joshua Tree National Park is the hike to the Lost Palms Oasis in the Southern section of the park. The Lost Palms hike is a moderately difficult 7-mile hike that takes you to the largest concentration of California Fan Palms inside Joshua Tree National Park. The hike takes you thru some beautiful scenery and involves a good deal of rock scrambling. If you attempt this hike, please make sure you bring an adequate supply of water. One of the most underrated and most overlooked activities in Joshua Tree National Park is star gazing at night. Joshua Tree National Park is renown for its amazing star-filled skies at night. Because the park is located away from unnatural light sources, the stars are crystal clear in the night sky on clear nights. You see some of the most amazing views of the Milky Way while enjoying the quiet serenity of the park. If you are looking for a group experience for star gazing inside Joshua Tree National Park, the Sky’s the Limit Observatory and Nature Center offers some guided treks into the park to observe the stars at night. I got feedback from a reader that it is highly recommended. Joshua Tree National Park is a beautiful park with some of the best rock climbing and scrambling in the world. It is also home to the highest concentration of Joshua Trees in the United States. Below is a gallery of just some of the images I was able to capture while visiting this amazing park. Thanks for putting this guide together Josh! This is absolutely killer. Literally everything I wanted to know!